Boston Location | Joel H. Schwartz, P.C. In the heart of downtown Boston, our main office is located directly next to Boston City Hall. As a landmark, Staples is located in our building. When you enter 1 Washington Mall, please give your name to the security desk. We are located on the top floor (16) of the building and we look forward to seeing you! Take the Green Line or Blue Line to the Government Center Stop. Upon exiting the station, turn right. 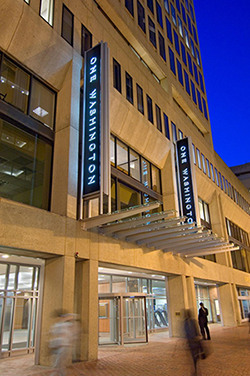 One Washington is the building next to City Hall Plaza. You will see the business Staples in our building. Take the Orange Line to State Street Stop. Upon exiting the train, follow the signs that say “Exit to City Hall Plaza.” Upon exiting the station, turn left and you will see One Washington. Take 93 North (Southeast Expressway). Enter the tunnel and take Exit 23 (Government Center) exit. At the end of the ramp, take a left onto North Street. Pass Faneuil Hall on your left, and at the end of the street (City Hall Building is in front of you), take a left onto Congress Street. Take a right onto State Street. A short ways up the road you will see One Washington on your right at the brick walkway, which is across from Washington Street on your left. Take 93 South to Exit 24A (Government Center). At the end of the ramp, take a right onto Clinton Street. Take a left onto North Street. Pass Faneuil Hall on your left, and at the end of the street (City Hall Building is in front of you), take a left onto Congress Street. Take a right onto State Street. A short ways up the road you will see One Washington on your right at the brick walkway, which is across from Washington Street on your left.